SAGE Foundation is the CSR arm of Thadomal Shahani Centre for Management, which focuses on creating heart centric business professionals who will be the transformational leaders of tomorrow. 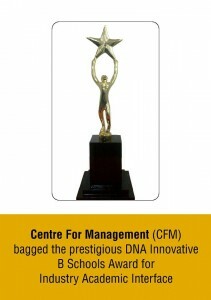 Centre For Management (CFM) was given the prestigious DNA Innovative B Schools Award for Industry Academic Interface at a glittering ceremony in Mumbai. These awards select top business schools from all over India and recognize them for the innovative work they do in areas like academics, placements & student marketing. TSCFM and SAGE Foundation Managing Director, Akhil Shahani said, “The main reason for business schools to exist is to create industry ready graduates who will go on to be successful corporate managers and entrepreneurs. This award recognizes the many initiatives unertaken by TSCFM to expose our students to industry and ensure they have successful careers in the corporate world.” Some of the unique industry initiatives taken by TSCFM include a curriculum created by industry and taught by senior industry professionals. TSCFM has also partnered with global industry bodies to give students regular industry visits, live projects and corporate learning events. Recruiters have said they are impressed by the maturity and industry readiness of TSCFM students.